It’s impossible to ignore the fact that oceans continue to be an important and reliable source of food. Dr. Ratana Chuenpagdee is the project director for Too Big to Ignore, a multi-year interdisciplinary research project involving over 15 partners including intergovernmental organizations, research and academic institutions, environmental and non-governmental organizations. Researchers across Canada and throughout the world are working together to investigate challenges and opportunities in the small-scale fishery sector. 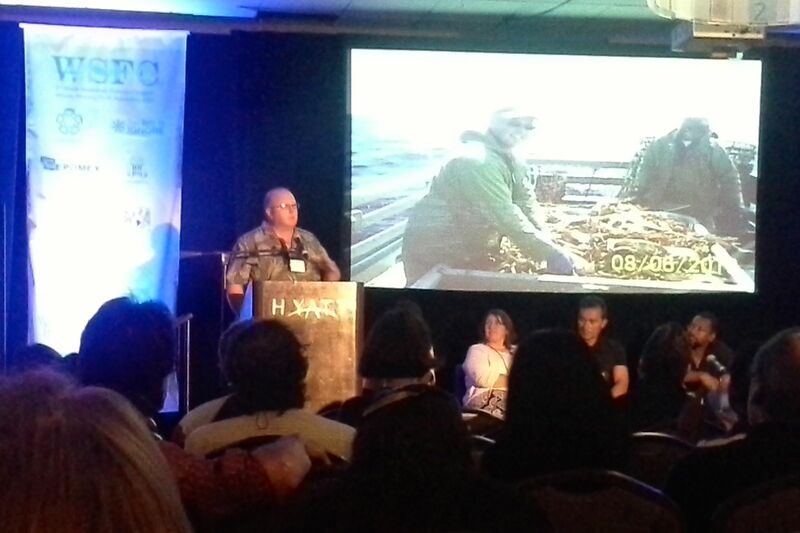 At Too Big To Ignore’s recent second World Congress held in Merida, Mexico, Bay de Verde fisher Tony Doyle was invited to deliver a presentation on the Newfoundland snow crab fishery and take part in a variety of panel discussions. “It was a great opportunity to meet with other fishers and learn what they do and how they do it,” said Mr. Doyle. He now has a better understanding of how fishers in other countries struggle and of the large amount of work being done studying fisheries by the academic community. For Dr. Chuenpagdee, the conference was about options and opportunities. One of the key items discussed at the conference was the adoption of the Food and Agriculture Organization (FAO) of the United Nations' Voluntary Guidelines for Securing Sustainable Small-Scale Fisheries, which is the first international instrument dedicated to the small-scale fisheries sector. Several key Too Big To Ignore members, including Dr. Chuenpagdee herself, have been involved both in the development of the guidelines and during the negotiations. Too Big To Ignore and the FAO sponsored a special plenary session at the conference to discuss and brainstorm the guidelines implementation. “The guidelines are important because they embrace policies and principles that promote food security and sustainability for small-scale fisheries – this is an important step in protecting the future of small-scale fisheries,” said Dr. Chuenpagdee. “Like other places around the world, small-scale fisheries in Canada are also marginalized, compared to their large-scale counterparts. Small boat fisheries here in Canada can certainly benefit from the guidelines so it will be in their interest to see that the government supports the implementation.” Canada joined over 100 member states in adopting the guidelines at the 31st Session of the Committee on Fisheries (COFI) of FAO in May 2014. Too Big To Ignore will continue to play an active role in supporting the implementation of the guidelines. Dr. Chuenpagdee and other TBTI colleagues will travel to Rome in December to participate in a workshop. For Tony Doyle, the collaboration between fishers and academics is vital.